Watching the first episode of the second season of American Inventor this week made me wonder what ever happened to season one's winner of American Inventor? I bet a lot of people are asking the same question. 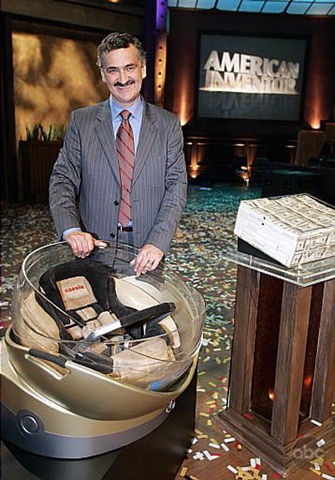 The grand finale of Season One of the American Inventor show aired on May 19, 2006 and Janusz Liberkowski won the title American Inventor. Janusz is the inventor of the Anecia Survival Capsule (a safer car-seat). About a year ago (July 2006), I provided you with my last update on the Anecia Safety Capsule. (If you are interested in reading it, click here.) I figured another update is over due but better late than never. "When Evenflo entered into a partnership with ABC's American Inventor Season 1 winner Janusz Liberkowski last year, a commitment was made to help Janusz take his design to the next level. Evenflo pledged to take the lead in engineering his prototype with the goal of taking the safety seat through a rigorous development and testing process to improve the original concept. Evenflo delivered its commitment. Over the last year, the company has worked closely with Janusz to create several variations of the Anecia concept, and to conduct a series of crash test experiments at its sled test facility. 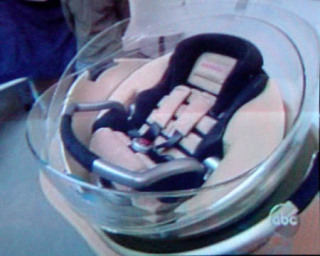 At this point, it has been mutually agreed that Janusz will be continuing development of the Anecia Capsule car seat with an outside design firm." So it looks like Janusz is no longer working with Evenflo to develope the Anecia. My guess is it was taking too much money to complete development of it. Bottom line, it looks like it's not coming on the market anytime soon. If anyone knows anything more about the Anecia, please feel free to contact me or post their comment here. I'll see you all back here on Wednesday night for Episode 202 of American Inventor. OneForty - The Apple Store Of Twitter Apps? allow any engineer to pass to the next level judges. against ABC in behalf of the audited participants who have been fooled. I have two inventions, one of them a real "killer". I was at Tampa too! Thay can do what they want as indicated in rules at their descetion. But, if It is in writing that no computer pogram software is allowed, they can be held liable since they allowed it and it also won (paper racers). I would think the other winner would also be disqualified since it's already patented (tree angel). Post these comments however in the Forum. I find this webpage, and now see CD dude is spamming Craig's List with his crap not 10 minutes later. I agree about what the first "Anonymous" said, although I am worried that he called his invention a real killer. This show has the worst turnover ratio in the auditions. Also, they boast that "It was one of the 10 inventions out of the field of 10,000," but if you never get in front of the judges, it doesn't matter. Yours could easily be better. So, note for next time, bring a 7-year old, toothless, Charlie Bucket-looking kid and say that he invented it and you're his "guardian." Also bring your life partner, liberal ABC eats that up. You will get the audition you request. And if you ever do check up on your post, may I ask, what were your inventions, anyway? For the man whose blog this is, I was wondering: What ever happened to the USA Network show "Made in the USA"? It was the precursor to this show, except it had teams and weekly challenges. I know the show was pulled from the air and the series ended with a series of webisodes, but who won? And what happened with their inventions? I expected the 1st show of the season to update us from last year. I thought many of the things not in the top 6 had potential. Not doing an update, showing at least one story of a product now available for sale say's "Why are we watching season 2." Obviously the show did not have any great stories of success to share. And then this year, they pick an under the counter wrap dispenser? I have one under my counter, it holds 3 rolls. I got it 4 years ago at Goodwill. My Mom has a wall mounted, holds paper towels and 2 rolls of wrap, plus it has a miniature hutch and a knick knack shelf to boot. got it on ebay, $14.99. If not for the Fireman, with his guardian Angel, I'd quit watching the show. what I find interesting with the 2007 winner is that the judges high end bussiness personel. forgot to ask what would their liability if the tree angel didn't work. That if people lost there life depending on it. And who would be resonsable for the lost??? MY NAME IS ANECIA!!!!!!!!!!!!! I THOUGHT IT WAS SO COOL TO HAVE A CAR SEAT NAMED AFTER ME!!!!!!!!!!!!!!!!!!!! WHERE DID YOU GET THAT NAME FROM? WHY DID YOU INVENT IT? Thanks for this blog, I was wondering about this product. So the show was dung?